Captain's Landing community is sold out and is not in active development by builder. If you are interested in Captain's Landing or similar new home communities, contact us today! Our agents are very familiar with new and newer construction in Norfolk, and can identify resale opportunities in Captain's Landing, as well as builder inventory available in nearby or similar communities in Norfolk. To view more pictures, interactive maps and the full, detailed description of the Captain's Landing community, please Login. 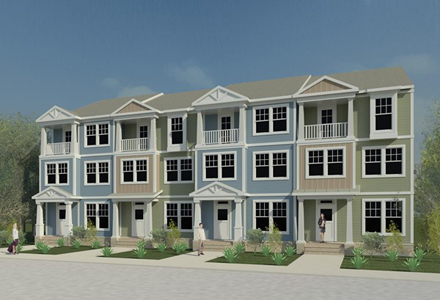 Captains Landing is a large community of thirty eight townhomes in Ocean View offering luxury living and easy access to the Chesapeake Bay. With modern open floor plans, oversized detached garages and balconies with picturesque views of the Chesapeake Bay, Captains Landing has all the charm and character one has come to expect from an EDC home. Captains Landing’s coastal-style homes feature many options such as bamboo floors, gas fireplaces, vaulted master suite ceilings, upgraded trim packages, and gourmet kitchens with granite countertops, stainless steel appliances, and 42-inch designer cabinets. Our Admiral model (Three Story) features a third floor entertainment/media room or second master bedroom option and a third floor balcony. If you are looking for a scenic water view in Norfolk’s fastest-growing neighborhood, look no further than Captains Landing! Send me more information about communities similar to Captain's Landing. Our agents gladly offer FREE property tours of Captain's Landing, Norfolk and homebuyer consultations to all serious buyers. Our Norfolk SH Pro is prepared to represent you and your interests so you can move into your dream home.